Cozy studio condo w/ shared pool & courtyard - easy beach access! Dogs OK! Property 1: Cozy studio condo w/ shared pool & courtyard - easy beach access! Dogs OK! Property 4: "SEAPORT SANCTUARY" ~ Come and Enjoy this Romantic & Lovely Couples Hideaway! Property 9: One Bedroom Pool Cottage, best Old Town location, walk everywhere! Property 10: Beautifully Restored Island home with private pool and off street parking. Property 12: The Hollinsed House - Harvey's Haven - Great Location!! Property 15: "TIDES ON SIMONTON" ~ Perfectly located just off Duval and all the fun! Property 16: Southernmost Retreat: 2 Blocks from Duval in Old Town. 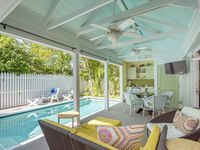 "PINEAPPLE COTTAGE" ~ Adorable, Updated Cottage in Old Town with Pool! Property 18: "PINEAPPLE COTTAGE" ~ Adorable, Updated Cottage in Old Town with Pool! Property 21: Family House- Two K bedrooms, 1.5 baths, Pvt.Spa in Garden Setting-Shared Pools! Sea Breeze Cottage in Truman Annex Location! Location! Location! Property 26: Sea Breeze Cottage in Truman Annex Location! Location! Location! Property 27: ~ SOLARIS GARDEN ~ Enjoy Old Town Livin' Just A Short Walk to All the Action! Property 29: McCartney's Manor- Luxury Private Cottage, Courtyard and Hot Tub! Property 33: Centrally located home w/ private pool 3 blocks to Duval St - dogs OK! Property 34: Cozy cottage w/ porch & great walking location - close to beach, small dogs OK! Property 44: Starr's Suite-Luxurious 2 Person Suite Steps From Duval Street! Property 45: Cozy cottage w/ private hot tub, tranquil garden & parking - dogs OK! Property 47: Harrison's Hideaway - Cottage, Pvt. Spa - 2 Shared Pools - Steps from Duval St.
Property 48: Dog-friendly, colorful cottages w/ pool & hot tub in a fabulous location! Loved the Tropical Jewel -- location, pool, the privacy, the yard!